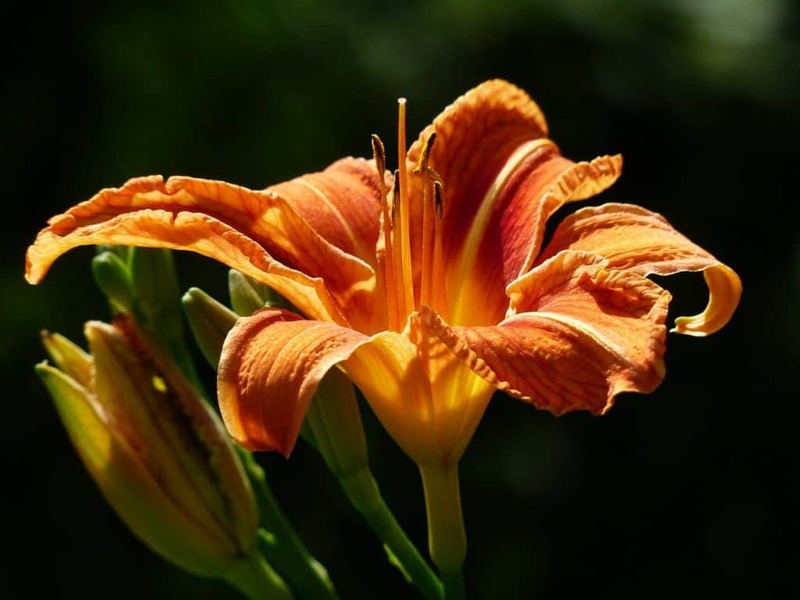 Daylilies are clump forming, herbaceous perennials with exotic-looking, trumpet-shaped flowers. Hemerocallis means ‘beautiful for a day’, a name that describes the plant’s flowers that open early in the morning and then wither and die during the following night. While individual flowers are very short-lived, the plant repeat flowers and can produce up to 200 blooms over four to six weeks. If numerous varieties are grown together it is possible to have an elegant and striking display of daylily flowers from May right through to October. 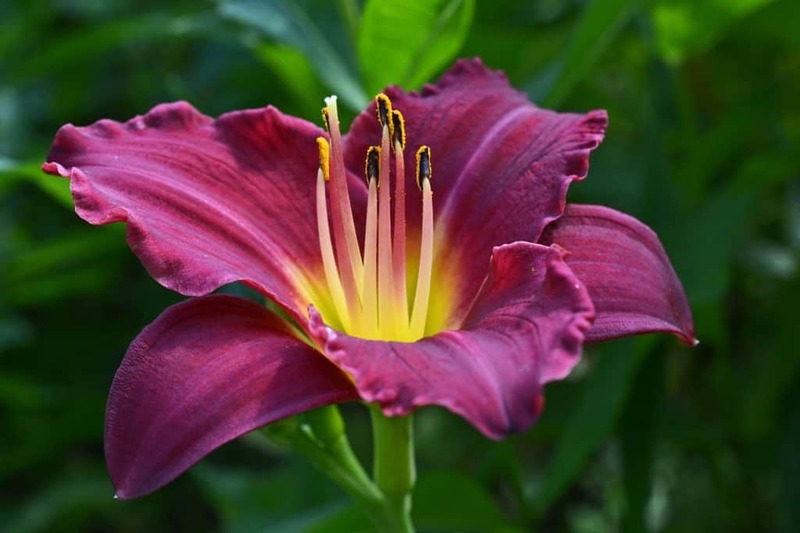 The most widely grown daylilies have orange and yellow flowers, but they are available in a rainbow of colours that also includes a near-white very pale green, pale pink, red, magenta and such a dark purple that it is almost black. True blue daylilies remain elusive despite the best efforts of specialist breeders. The flowers attract pollinators and beneficial insects including bumble bees and hoverflies. Most die back in the winter, to emerge early the following spring with fresh bright green foliage. In milder areas they can be semi-evergreen, and some of the newer cultivars are close to being fully evergreen. This article recommends some of the best varieties from the almost bewildering array that is available, and provides useful information on caring for these ephemeral but eye-catching blooms. Nineteen Hemerocallis species are recognised from Asia and, of these, some 15 species have been used by plant breeders around the world to create approximately 80,000 registered cultivars. Enthusiasts are constantly improving the plant, and look for qualities such as height, scent, ruffled petal edges, contrasting flower centres, and even a speckling that gives an illusion of glitter, called ‘diamond dust’. Some of the forms that have been produced are loosely grouped as ‘starry’, ‘floppy, ‘ruffled’, ‘circular’, ‘triangular’ and ‘spidery’. Literally hundreds of cultivars of daylily are available from garden centres and nurseries as seed, bare-rooted and container grown plants. These are some of the most popular. This is a spectacular orange, ruffled, double flower with bright red tangled markings. It will flower continually throughout the summer months, and the dense foliage makes good ground cover that can suppress weeds. It grows up to 80cm tall. Another double flowered cultivar, ‘Double Red Royale’ produces deep burgundy flowers that are edged with white. ‘Corky’ makes a compact, perennial clump that grows up to 70cm in height. It has open, trumpet-shaped, lemon yellow flowers up to 6cm in diameter, with characteristic mahogany-coloured stalks. It has been awarded the RHS Award of Garden Merit. This 80cm tall variety produces unusual deep-purple flowers throughout the summer months. The flowers are unusually large at up to 12cm in diameter. ‘Whichford’ is one of the taller daylily cultivars at up to 1.2m in height. It forms a dense clump and has pleasantly fragrant, narrowly trumpet-shaped, pale greenish-yellow flowers up to 10cm in diameter that open from green buds. ‘Marion Vaughn’ is an evergreen cultivar that grows up to 1m in height. Its flowers are scented, and the pale lemon-yellow petals have subtle white midribs. It is useful in a mixed daylily planting as it blooms freely through late August and early September when other varieties may have finished. This is a late-flowering cultivar that makes a great companion to ‘Marion Vaughn’, from which it will take up the flowering baton in early autumn. It is a striking mahogany-red with yellow throat and has the RHS Award of Garden Merit. The striking fragrant blooms of ‘Destined to See’ are a rich cream colour with a lavender eye and dark fringe. ‘Stella de Oro’ is a one of the shorter varieties of daylily, forming a compact clump around 30cm tall. It has 7cm diameter, fragrant, bright yellow flowers with an orange throat. This large-flowered cultivar has rusty-iron red trumpet flowers with yellow throats. ‘Luxury Lace’ is a good choice for gardeners looking for an evergreen daylily that flowers freely throughout the summer. The star-shaped, 10cm flowers are orange with a green throat. The plant grows to a height of 80cm. ‘Serena Sunburst’ is a one of the most attractive pink-flowered daylilies. The large flowers are 10cm across and have delicate ruffled edges. The petals are a pale peach with warm yellow highlights and a narrow yellow border. For the white garden, ‘Joan Senior’ is semi-evergreen and has funnel-shaped soft white flowers with a pale green centre. They have a hint of pale yellow when they first open. Daylilies bought in 9cm containers can be planted out at any time, provided any danger of frost has passed. However, they are generally sold as bare root plants with most of the foliage removed. They will travel well through the post in this way if purchased on-line from nurseries, and those bought in bags from garden centres can be checked to ensure that they are firm and that there are plenty of growth points. Avoid any bare root plants that have already produced long, pale shots. They are best obtained in the spring or autumn, though with care they will survive planting at any time during their growing period, as long as they are soaked well before planting and kept well watered in dry spells. April and late September or October are the traditional daylily planting seasons. The hole should be larger than the daylily root to be planted. Mix well-rotted compost or manure into the soil at the base, and into the soil that will be used to back-fill. The crown of the plant should end up approximately 2.5cm below the soil surface, and the roots can be carefully spread away from the crown. A good tip is to dig the ground well, add the organic material and mix it in, then create the hole with a firmed mound of replaced soil in the base of the hole such that the crown will be buried at the correct depth, and there will be no air pockets beneath the crown. The roots can then be spread down the sides of the mound. Replace the remaining soil and firm, avoiding any direct pressure on the area above the crown itself, and water in well. Plants bought early in the year can be potted into a peat-free, multi-purpose compost and kept in a cold frame or unheated greenhouse. They should be kept moist and once growing strongly they can be planted out in the spring, when they will have a head start over those planted directly into the garden. Once flowering, the plants should be dead-headed regularly, preferably daily, and some of the taller varieties with larger flowers may need staking to avoid them flopping over under the weight of the flowers. Once flowering has finished on a stem, it can be cut down to the ground. Once the whole plant has finished flowered, cut the foliage to the ground as it begins to look untidy, and it should produce some fresh, green growth, although it will not flower again. Daylilies thrive in a sunny spot. Some varieties can cope with a degree of shade, at least for part of the day, but in such conditions they are likely to produce smaller and fewer flowers. Plants grown in too much shade tend to lean noticeably towards the light, and can become floppy and untidy. The dark-flowered cultivars often do a little better when they have some dappled shade during the middle of the day, as the flowers will fade early in the full heat of the summer sun. Daylilies have a reputation for being drought-tolerant, and while they will generally survive through extended dry periods, the plants do need some water for the buds to form properly and for the continuous repeat flowering that they are famous for. Plants that are watered well through the summer will produce larger and more prolific flowers. However, daylilies do not enjoy waterlogged conditions, so the amount of watering needs to be matched to the soil’s capacity for drainage. Mulching with garden compost or another organic material in late autumn and then again in the spring will help to maintain appropriate water levels in the soil. Daylilies are not particularly fussy about pH, and they will grow well in acid, neutral or alkaline conditions. They show a distinct preference for a well-drained but moisture retentive, fertile soil and they can be kept in top condition by providing them with plenty of organic matter. The soil can be improved before they are planted by digging in well-rotted manure or garden compost, followed with an annual mulching of the same material. While not really hungry plants, daylilies do nevertheless respond to feeding during the flowering season. A low-nitrogen, general purpose fertiliser applied in the spring at the rate of 50g per square metre will help the plants to form and produce plenty of flowers. Organic gardeners can use pelleted chicken manure, which should be scattered liberally around the plants during wet weather. Although it is possible to grow daylilies in containers, they will need careful planting and management to ensure that they have enough root space and get plenty of water. It is better to use one of the smaller varieties such as ‘Stello d’Oro’, and only put one plant into each pot, which should be no smaller than 30cm in diameter. For anything other than the dwarf varieties, the pots should be even larger, preferably 45cm to 60cm in diameter. There must be plenty of good-sized holes in the base of the pot, with a layer of broken crocks, and the pot should be supported on pot feet to ensure free drainage. Use a container compost with good water-retentive qualities, and preferably add a proprietary water retaining gel or crystals to the planting mix to hold even more of a water supply around the roots. As with the those planted into the open garden, the plant should be supported on a mound of compost in the base of the hole before filling the pot to a depth that leaves the crown 2.5cm beneath the surface of the planting medium. Once finished, there should be at least 2cm between the rim of the pot and the surface of the compost to facilitate easy watering and to prevent run-off of compost and exposure of the crown. The pot will need to be watered each time the top couple of centimetres of compost feel dry to the touch, and they should be watered until an excess starts to appear through the basal drainage holes. This may become a daily task in hot, dry weather. Daylilies do not require pruning, but they can be dead-headed to maintain flowering and to improve their appearance. Untidy foliage can be cut back at any time once flowering has finished, though some specialist growers recommend pulling the browned leaves off the plant rather than cutting them, as this reduces the availability of niches for pests and diseases to become established. Seeds can be sown in pots or trays in a cold frame in the autumn or spring. Home-collected seed will not come true, so to raise any specific variety or colour the seed will need to be bought from a specialist breeder. The easiest way to create more plants is to divide clumps every two to three years in the autumn or spring. This has the additional benefit of reinvigorating the plant. Clumps should be carefully lifted with a garden fork, and if the root is particularly dense or hardened, use a sterilised garden saw or very sharp knife to cut it into pieces that are approximately 10cm to 15cm in diameter. Younger clumps can often be pulled apart by hand or separated using a levering motion with two garden forks used back-to-back. Replant the pieces as soon as possible after separation, and replant them in the same area 30cm apart, or distribute them to new homes elsewhere in the garden. Autumn-divided plants can be potted up to be kept in a cold frame or unheated greenhouse through the winter to get an early start the following spring. Daylilies tend to become progressively more prone to pests and diseases as they age and start to lose vigour. Lifting and dividing the clumps in alternate years and revitalising the soil before replanting will help to keep the plants healthy. As with most herbaceous plants that produce an abundance of fresh green growth each spring, the new shoots and leaves of daylilies are tempting to slugs and snails, so some protection might be necessary for the first few weeks in spring. A more recent concern for daylily growers is the hemerocallis gall midge. This affects the buds, which form a distorted and swollen gall in place of the flower as they host the larvae of the midge, then go brown as the larvae leave the bud and head for the soil to continue the insect’s life-cycle. The problem generally affects only the early blooms, and picking off the affected buds as soon as they are noticed will help to control future infestations. Research by the RHS suggests that the insect does not spread widely from the host plant, so an outbreak should be reasonably easy to control. Meticulous dead-heading after flowering may also help to reduce the impact of an infestation. Some cultivars are more prone to hemerocallis gall midge than others, so it may be necessary to invest in some new plants of a more resistant variety if the problem persists in a garden. Thrips can also be a problem on occasions, especially, it seems, with the double-flowered varieties. If these insects get inside the buds they can cause distortion and the petals will turn brown before the flower opens fully. An insecticide or organic alternative will help to control the problem. Daylilies are generally resistant to diseases, though weakened plants may suffer from fungal infections such as rust and Botrytis. Affected foliage should be removed and destroyed. Q How can I make the most of daylilies in my garden? As well as making great herbaceous border plants, daylilies are finding a natural home in contemporary hot garden schemes. Try the white and near-white daylily varieties with hardy cranesbills, lupins, scabious, delphiniums, foxgloves, phlox and roses for a traditional cottage garden effect. Bright-coloured daylilies contribute perfectly to the swathes of bold and startling summer colours in the hot garden, contrasted against the softening effect of tall, subtle grasses. The mahogany-red of ‘Stafford’ complements the purples of Verbena, Allium, Agapanthus and catmint, while the rich peach of ‘Serena Sunburst’ will stand out from the back of a border and punctuate areas of background foliage plants. Any of the darker red daylily varieties will look good with Crocosmia, red-hot pokers, sunflowers and Rudbeckia in a later summer flowering display. In any scheme, use a number of varieties to give colour right through the summer. The attractive and reliable arching leaves of daylilies can also be used to soften straight lines along hot garden edges and pathways.